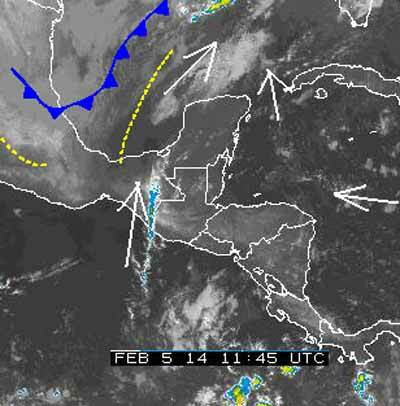 Belize NMS: A light east-southeasterly airflow maintains mainly fair conditions. 24-hour forecast: Mostly sunny skies today and partly cloudy skies tonight. Mostly sunny skies tomorrow. Only isolated showers are expected. Today: Winds: E-SE 5-15 kts. ; seas: Choppy. ; waves: 3-5 ft.; isolated showers. Tomorrow: Winds: E-SE 5-15 kts. ; seas: Chopppy. ; waves: 3-5 ft.; a few showers mostly north. Marine Outlook: Thursday night:- Winds: E-SE 5-15 kts. ; seas: Choppy. ; waves: 3-5 ft.; showers becoming generally isolated. General Outlook: Some cloudy spells with a few showers mostly along the coast Wed. morning and inland Wed. afternoon then becoming generally isolated. There is no Rain showing up on any Radar picture for over 400 km. There is a narrow, high speed high level cloud streaming up from the South. .. It was this that indirectly, triggered those line squalls yesterday. This is the first of the Tropical weather coming up.. . ...Presently little Caribbean cloud showing. I expect a fair bit of sun today, once the Fog has burnt off, with some clouds developing during the day, but not expecting rain. On Ambergris Caye this morning we have an expected high of 86. The sky is clear and breeze from the South East at 9 mph. Any idea what's expected for this weekend? I'm moving from Corozal to San Ignacio and hoping for no rain. I can only say what I see. That is what I see on the Radar, on the Satellite picture and what I can see with my own eyes, ears and feel. So how far I can see Ahead, depends very much on the type of weather ..
Our present type of Caribbean Easterly winds, with influences from the North, such as cold fronts, South Tropical weather and the prevailing SW high level air stream, it can be hard to see that far ahead. But the indications I am seeing are that we are at last moving away from that long period of problematic rains. Actually the total rain for 2013 was not that much more than usual. It was the way it happened that has caused so much problems. Right now, there is a cold front moving in from the NW, but I think it is a very mild one and will probably not effect us too much. But then again Cold air mixing with warm Tropical air from the South, often result in a line of rain. . ..It was something like that, that brought that line of rain over most of Belize yesterday. Right now, I am not seeing big signs of rain, but that can change fast.